Republic of Texas represented at its fullest extant. This is a fine example of the 1844 Black Map of Mexico, California and the Republic of Texas (fullest extent). The map covers from the southern border of Oregon as far south as Guatemala including New Mexico (with modern day Arizona), Utah (with modern day Nevada), and California. An inset map on the lower left corner details Guatemala and Belize. Cities, towns, rivers, mountains and other topographical details are noted with relief shown by hachure. In addition to Mexico proper, this map includes Texas at the end of its decade of self-rule as the Republic of Texas. Issued just one year before the 1845 annexation of Texas by the United States, this map presents claims Republic of Texas at their fullest, including not only modern day Texas, but also much of modern day New Mexico, Kansas, Colorado, Oklahoma, and Wyoming. Much of this territory would be surrendered by Texas in the Compromise of 1850, in which territory was exchanged for the federal assumption of the former Republic's war debt. 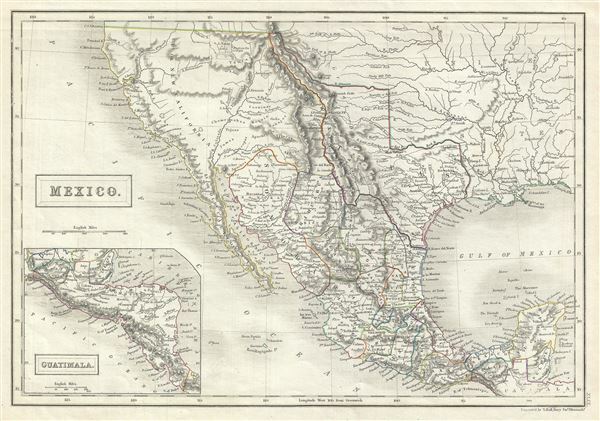 The map includes the Mexican territory of Upper California (including Utah and New Mexico Territories) which was later ceded to the United States at the end the Mexican American war via the 1848 Treaty of Guadeloupe Hidalgo. Black erroneously combines Great Salt Lake and Utah Lake - a curious and uncommon mistake that is most likely merely an engravers blunder. Nonetheless, the depot of the American Fur Company, roughly where Salt Lake City stands today, is noted. The interiors of the western United States remain relatively unmapped though the coastlines are accurately rendered. This map was engraved by Selina Hall and issued as plate no. XLIX in the 1844 edition of Black's General Atlas of the World. Hall, Sydney, Black's General Atlas: Comprehending Sixty-one Maps from the latest and most authentic sources, (Edinburgh: Adam and Charles Black) 1844. Black's General Atlas was a popular Scottish atlas of the world issued by the Edinburgh firm of Adam and Charles Black. This atlas was first issued in 1840 with subsequent editions being printed well into the 1890s. While most editions were printed in Edinburgh, an American edition was issued in 1857. Most early editions of his atlas were engraved by S. Hall. Typically this refers to Sidney Hall, who died in 1831, but in this case, since the engraving was initiated well after his death, it was most likely his widow, Selina Hall, who did the engraving. Later editions feature additional maps updated and engraved by William Hughes. Early editions featured outline color only, but later editions embraced a full color approach with pale green, yellow, and blue pastels. All editions are known for their meticulous presentation of the most up-to-date cartographic information. Moreover, this exceptionally long publication run provides a fine cartographic record of the middle to late 19th century - particularly as regards the complex cartographic evolution of the Americas through this period. Very good. Wide margins. Blank in verso.